In Tuesday’s post, I shared a brief recap of last week’s trip to Pennsylvania and mentioned a bit about my work-from-home job. It made me realize I haven’t shared about my job in this space so I thought I’d take a minute to expand a little more on it. I have a part-time job working remotely as an administrative assistant for a nutrition counseling company based in Philadelphia. I got connected with the position through a friend from college and started working in July 2017. (I previously spent 6 years teaching special education but took a step back from teaching after the 2016-2017 school year to become a stay at home mom). 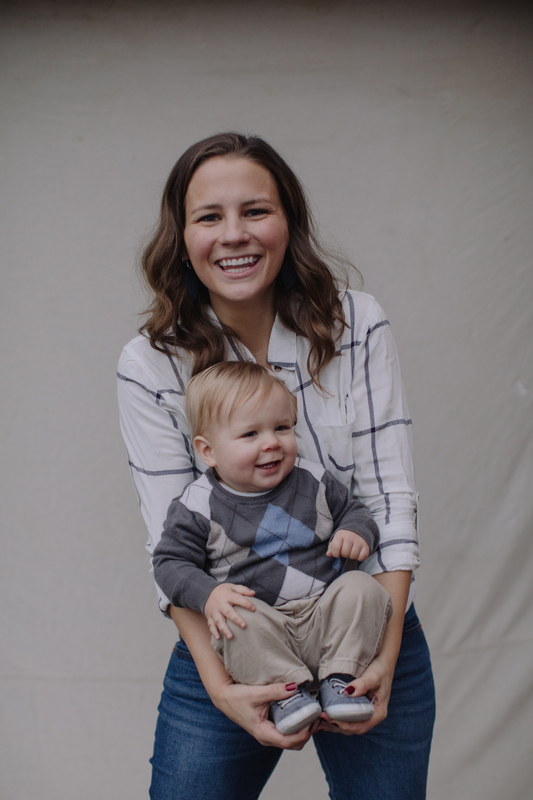 LJ was born in November 2017 and after a six week maternity leave, I’ve been juggling work- and stay-at-home mama life ever since. The majority of my work tasks involve scheduling clients, contacting insurance companies, and keeping up with referrals, all of which I can do via email or phone. It is flexible and very organizationally-minded if that makes sense (lots of spreadsheets) and I love it! In looking at the past six months, I’ve averaged 1 – 1 1/2 hours of work each day (around 7 hours/week or 27-ish hours of work per month). Every day looks different but I’ve come up with a pretty good little system that works for me. Today I thought I would share some of the things that help me to simplify the chaos of keeping up with work while still balancing life as a stay-at-home mama. Keep in mind, every mama and baby is different and there are so many factors with working from home. This is what works for me and might not work for everyone. I hope in sharing what has helped me, I can help just one work-from-home/stay-at-home mama who is feeling a little overwhelmed with trying to manage it all. We don’t have room in our house for a true office so I set up a little workspace on our upstairs hallway landing with everything I need for my workday. I used to work here every day, but since the desk is right outside LJ’s nursery I end up working downstairs at the kitchen table if I have to make phone calls. I still prefer the desk space though because it’s too easy for the kitchen space to become cluttered with my work things. I also think it mentally helps to have a designated work space because I know when I’m sitting at that desk, it’s work time and I don’t get distracted by anything else (because there’s nothing else there), whereas in the kitchen I can see other household things I could be doing. At this time, LJ is still taking a good morning and afternoon nap (I know this won’t last forever but let’s not focus on bursting that bubble right now). As soon as I put him down, I get to work. It’s hard to predict how long it’ll take me to get through my tasks, answer emails, etc and my time worked varies each day so I want to make sure I have time to get it all done. I will say it’s pretty rare to work less than 30 minutes or more than 3 hours, although it does happen. On the busy days, I need every minute of nap time for my job and everything else has to wait. On the light days, I can quickly finish up work and then move on to cleaning or laundry or whatever else I need to do. I always want to make sure my job tasks get finished, even if means laundry or cleaning has to wait another day, so I start with work and don’t let myself get distracted with other things until it’s done. Obviously, it doesn’t always happen that I get 100% of my work done during nap time and I sometimes need to finish up with LJ awake. When he was little, I often had him sit in a booster seat and play with a few toys next to me, like pictured above, but now that he’s bigger I just take my laptop into the playroom and quick finish up while he’s playing nearby. I try to focus on my “must-do” tasks if he’s awake and any non-urgent work tasks I usually just save until his next nap or the following day. For me personally, I don’t work with the TV on or podcasts going or anything that might shift my attention. I will sometimes listen to a Pandora station for soft background music, and I will definitely have some Christmas music playing in a few weeks, but I often prefer silence when working. It just helps me stay focused and efficient to finish up quicker. One of the biggest pros of a flexible work from home job is that many of my tasks can be done at any time, from any location. This can also be a stumbling block though: I used to check emails or do work at all hours, which made me feel “on the clock” all the time. Now I make a conscious effort to honor my business hours and not work after 5:00 pm. If 5:00 hits and I’m still working, I finish up whatever I’m doing and then don’t check my email again until the next morning. There is still the occasional day where I’ll work on a project in the evening hours after LJ goes to bed; however, this is usually something I have planned in advance to do so I don’t take up more of my daytime hours working and is typically reserved for extra projects I’m assigned outside of my normal daily tasks or days when LJ just didn’t nap well and I couldn’t finish everything. Maybe you have a job from home that doesn’t need to be during regular business hours but I still highly recommend trying to set a designated time frame for work so that it doesn’t become something that takes over your day. These things are small but they create an enjoyable atmosphere for working! This is probably the biggest one for me. It is so important that I am realistic with what I can accomplish in a day and start each day with a flexible mindset. Babies are unpredictable! There are some days where LJ naps a long time and I have time to get all my work done, clean, and even read a book while he sleeps. Then there are days where he doesn’t nap well and I’m lucky to scrape by with just getting my work done. There are days where we have obligations outside the house that throw off our schedule. There are days where one or both of us feels sick and we just need lots of cuddles on the couch. I also want to be clear that I do not do it all. I might get through the day with all my work done and a clean bathroom but there’s a pile of dishes still in the sink. Or the kitchen is sparkling but the laundry basket is overflowing. I can’t focus on everything or it becomes too overwhelming to do anything. So I focus on realistic expectations. My #1 goal each day: LJ and I are both fed, happy, healthy, and alive at the end of the day. If nothing else, that’s all I really have to accomplish each day. Then my goal is to finish my work tasks, or at the very least, get to all tasks that must be addressed that day. Then I’ll try to clean a room or empty the dishwasher or finish laundry. But if it all that doesn’t happen, I have to be willing to be okay with that. I start out each day with goals, but I have learned to give myself grace if the day ends and I didn’t get as much done as I had hoped. If you have a work-from-home job, I’d love to hear what works for you!